Removing a tree from your property oftentimes involves more than just felling it. After the tree is felled there is a stump left behind that needs to be taken care of regardless of how close to the ground the tree was cut. 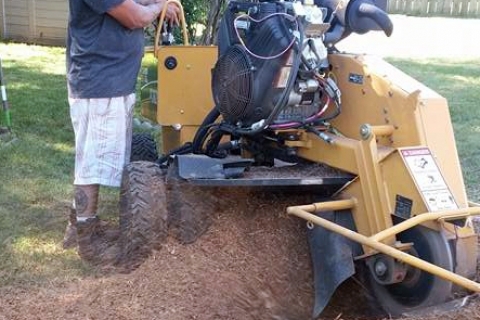 In this post, we will look at three reasons you should contact Seaben for stump grinding service in Kalamazoo. While some people will use a stump as a landscaping piece to plant flowers that’s not usually an option because the reason the tree was cut down in the first place is due to sickness or disease. For most people a stump means an eyesore and adds another feature that needs to be mowed around. And having the stump ground and completely removed allows for an opportunity to plant a new tree or other foliage. Not only is leaving a stump a potential trip hazard that your insurance company may not allow, the roots can also cause serious problems such as underground pipes that could be vulnerable to bursting. This type of peril oftentimes is not covered by insurance. Stump grinding is a great way to kill off the tree and prevent root growth. It’s unfortunate, but trees to get sick. This is a common reason homeowners call a tree service to have them removed. If it is determined that the tree is diseased, it is extremely important not to leave the stump and living root system in the ground. If the diseased stump is left, the disease can spread and cause problems for other trees and foliage in your yard. At Seaben Tree Service, we have decades of experience in removing trees and stump grinding in Kalamazoo. Do not hesitate to contact us today!